sacred sounds of creation or plain bio-mechanics? "Every vibration in this universe has colour and sound. Every vibration also represents a particular idea, and hence each idea has a vibrational sound and vibrational colour". It's ancient wisdom: if you can name it, you can control it. Possessing language means, having the conceptual power to consciously deal with your perceptions, and therefore control reality. It distinguishes human mind from animal mind, more fundamentally than intellect per sé. Hence, language is an essential skill. It is a conceptual phenomenon, connecting subjectivity with objectivity. However, in traditional Eastern perception, language has a different and virtually opposite impact than in the West. Ideally, in the subjectively oriented Eastern mind, language is universal and hence generically creative. If the science of the sacred sounds of creation is properly developed and cultified in one form or another, this may result in some objective effect. This use of language is referred to as "incantation". Vice versa, if objective language is cultified, this may lead to conceptual insights. This use of language is called "physical science". Clearly, both uses of language render some form of control over reality, albeit from fundamentally different angles. In one view, nature is the result of divine incantation. In the other, personal insight results from describing the laws of nature. The beautiful and very elaborate science of phonetics, with its sub fields of articulatory-, acoustic- and auditory phonetics, objectively analyses how the sounds of human speech are created, composed and processed, but does not hint at the universal quality and creative potential of sound. These complementary aspects of language use are captured together in the geometric origin of selective sound perception. This article will first discuss some key aspects of phonetics, focusing mainly on the acoustic composition of vowels. Then it will be shown how sympathetic vibrations in a universal (meta-stable) medium accurately predict the positions of the vowel's characteristic resonance peaks, or formants. Finally this will be placed in the context of contemporary creation theory, including microvita cosmology and wave matrix physics. The physical composition of vowels has been studied virtually since the time it was possible to record sound, in the late 19th. century, and will be summarized here only briefly. Vowels are expressed through two main resonance peaks in a harmonically rich sound flow. In human speech, the sound source is the vocal chords, the resonances are shaped in the vocal tract of mouth, nasal cavity, tongue and lips. The resonance peaks are called formants (F1 and F2, resp. ), and their ratio as well as absolute position determine the vowel. Vowel generation has the rather striking characteristic that the formant positions are independend of the pitch of the voice. For example, the formants for the sound "a" (as in spa) are roughly around 800 (F1) resp.1200 (F2) Hz., equally for a child's or a man's voice. Consequently, high pitched singing (soprano) may impede the pronunciation. Another consequence is that pitch transition of a song is not easy - e.g. spoken words pitched up tend to suffer the infamous "Donald Duck" effect. Modern pitch transition software can deal with it properly. Below picture shows the formants in a normal vowel spectrum and spectrograms (spectral time progression) of the vowels [i], [u] en [a]. There are about 10 clearly distinct vowels commonly used in English and / or other Western languages. Slightly different sounds and / or pronunciations exist but can generally be considered variations of these vowels, mostly in local languages or dialects. 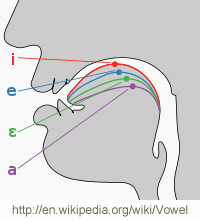 The vowels are mapped in the IPA vowel chart (International Phonetics Association), which rougly coincides with the actual formant positioning. 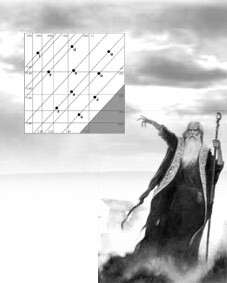 Formant (resonance frequency) positions are usually mapped in a logarithmic F1 vs. F2 graph. Below example shows the formant graph with the vowel positions which will be used later on. The gray area is where the formant ratio is 1 or less, which is physically trivial. Below table lists the 10 main vowels and their formants (Herz) with examples in different western languages. Throughout this article, phonetic characters are shown as images, as the phonetic font (TTF) may not be available in the fonts archive. Despite their rather sketchy positions, the allover distribution of the formants seems to be roughly uniform within the allowed bandwidths, leaving equal and ample space for all the formants on the logarithmic scale. The bandwidths are approximately known: the lowest F1 should not be affected by high pitched voices, whereas the highest F2 should still be in the range of sufficiently powerful harmonics from the sound source. These criteria concern the absolute positions of the F1 and F2 formants, however without explicity relating them to one another (i.e. within a vowel). The latter, defined as the formant ratio F2 / F1, will be shown to be of pivotal importance for a geometric analysis, whereas at the same time it should be mentioned that the formant ratio alone does not uniquely identify all vowels. In other words, different vowels can have the same formant ratio but with different absolute formant positions. The combination of the individually perceived formant positions, the criteria for their absolute positions and the ratio within each vowel will be used as the phonetic basis and reference to develop a consistent geometric (wave matrix) model for a true physics of vowel expression. In addition to the existing sub-fields of phonetics and within the light of the universal meaning of language, this new field could be referred to as causal phonetics. The medium which contains or embodies the whole of classical physics plus all expressions which are commonly considered "anomalous" (in fact, life and all its unique characteristics), is referred to as the universal medium. Association of the universal medium with "consciousness" may not in all circumstances be inadequate, but is better avoided. The priomordial state of the universal medium, rather than considering it "active" or "inactive", is described as the phase of "homomorphic evolution", that is, there is no net causation and hence no actual creation. The phase of awakened causal factors is referred to as "auto-genesis". The universal medium itself remains the ultimate material cause. However the mechanism of causation is not one of actual control, i.e. it is not a linear projection, but it consists in the form of a dynamic balance of facilitating and attractive forces, called causal factors. This constitutes the triangular receptacle of the universal medium in the phase of auto-genesis, also referred to as the Causal Matrix. In the phase of homomorphic evolution, the causal factors remain indistinguishable. If the triangular figures of the universal medium in the phase of auto-genesis are taken in the form of waves (i.e. causal waves), the creating entity is referred to as a wave matrix. Conceptually, each individual wave is contained in the triangular receptacle of causal factors, whereas vice versa, causal factors are expressed through wave coherence (interdigitation and nesting). Thus, there is an intimate mutuality between the Causal Matrix and the wave matrix. As the intermediate stage to subsequent stages of expression, the wave matrix could be considered the secondary stage of the Causal Matrix, whereas the receptacle of causal factors constitutes the primary stage. In physics terms, the activity of the Causal Matrix, resp. wave matrix is called symmetry operations and essentially describes the phase of auto-genesis or generic causation. Creation however would still remain rather theoretical without the emerging of individual mind (in practice, biological mind with senso-motoric faculties and a central nervous system). This will not be discussed in detail here, however the impact of individual mind, that is, individual perception and conception is critical to understand the geometric origin of phonology, or causal phonetics. The essence of individual mind lies not in any physical separation or even distinction from the universal medium (resp. Universal Mind). It rather consists in the individual and collective idee-fixe that the objective world, including our biological body represents the ultimate reality. This is in fact our normal state of mind, philosophically referred to as "maya" or "samsara", or similar ideas. For clarity sake, "spiritual liberation" means that the mind realises subjectivity as the greater reality, and is thus freed from all physical bondages. However the true state (salvation) is that neither objectivity or subjectivity is the ultimate truth, but the universal medium itself which has nothing to do with any conceptual or perceptive effects. Hence, the transformation of the universal medium into the medium of the individual mind is clearly not one of subjectivity into objectivity, but one from universality into subjectivity-plus-objectivity. Whether or not this is considered a psychological event, it definitely has a physical effect. Clearly at this stage, psychology and physics go hand in hand, leading to the tangible universe as we know it. In terms of contemporary computer games, this does not create virtual reality alone - it verily has a built-in physics-engine. In this condition, the Causal Matrix is totally hidden from our view and as a result we have become immersed in the mental and emotional imagery of everyday life. It is a state of inversed causation, with its own consistent reason and logic. For scientific reasons we may or may not appreciate the concept of "individual mind", as it can seem a bit distractive. Either way this will not affect the physical reality of the transforming universal medium, which can physically (as well as psychologically) be described as the phase of "inside-out-ness". It should be understood that this does not mean "inside versus outside our body", as with not too much introspection we will find that the body equally belongs to the outside world, and even does our brain. Instead, it means, inside versus outside our true selves, that is, the deepest creative and witnessing state of our being. And this is of course, the Causal Matrix itself. The individual mind's polarisation of the universal medium into objective versus subjective regimes, is physically modelled as a torus. Clearly it is not the "mind" itself which constitutes that state, as "mind' is nothing but a name for the endless stream of associative imagery. It we define "physical reality" as that which is thus created by, or in the individual mind (while anything else is called "abstract") we can say that the torus represents the only sustainable, and therefore primordial physical shape in the original, that is, undifferentiated universal medium. Summarizing, the Causal Matrix constitutes the total body of symmetry operations of the universal medium, wheras the torus models the universal topology of the universal medium being turned "inside-out". The generic "subjective" and "objective" principles, being utterly conceptual, belong to the Causal Matrix, and neither to the transformed medium, nor to the mind. The physical binding between the causal symmetry operations and the torus is therefore considered to be based on charge flow, rather than on wave discipline directly. limitations of the illusionary world - from the movie "The Matrix"
The torus forms the topological shape of the universal medium turning inside-out. Hence it is not bound to any actual physical size. Its shape, rather its inner aspect ratio's may not be of immediate importance to its dual spin principle, however there is a compelling geometric clue that a purely circular model, with zero hole diameter is ideal. This model will be used. In pure physics terms, the torus could be identified as an electro-gravitational hydrodynamic vortex, whereas it is suggested that coherent electro-gravity is but another term for expressed consciousness. Another term is a hydrodynamic charge domain. In that capacity, the torus constitutes the ultimate physical shape or "ultimate atom". The combined rotational and toroidal spin, creating a vortex in the centre, is visualized by means of a single representative charge path. Now, the physical state (not: shape) of the E-G-hydrodynamic torus is determined by the absolute spins as well as the spin ratio, defined as rotational spin / toroidal spin. In physics terms, it could point at a certain balanced or imbalanced electro-gravitational effect, however the relevance for phonetics can be extracted from the pure principle. This sequence constitutes resonant spin ratio's of a self-sustaining toroidal vortex. 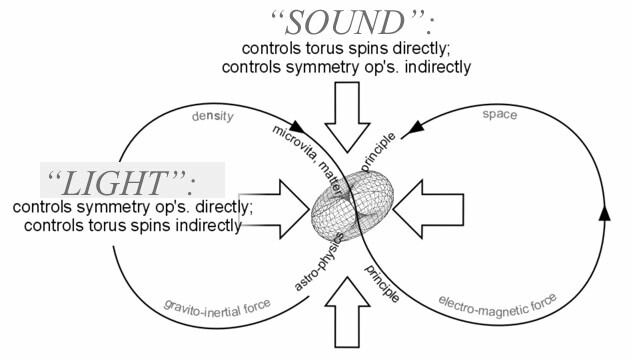 The challenge of "causal phonetics" is to correlate acoustic phonetics, that is, the formant positions of distinct vowels, with toroidal spin physics, in other words, sustainable spin ratio's in a universal medium. As mentioned in the introduction, the science of phonetics objectively analyses how the sounds of human speech are created, composed and processed, but does not hint at the universal nature and creative potential of sound. With the discussion of respectively the physiological principle of speech generation, and the emerging of a toroidal principle in a universal medium we have stumbled upon a striking similarity: both principles describe the emerging of a stable dual resonance or -oscillator in a harmonically rich environment. In acoustic phonetics, allthough the formants, that is, the individual resonance peaks for each distinct vowel are known, there is no clue about a non-trivial physical correlation between the two, that is, their ratio. Such correlation was found in the case of the essentially same principle of toroidal spin physics, resulting in a sequence of resonant spin ratio's. A universal denomination of the vowels of human language might therefore be formulated as a combination of the criteria for toroidal spin resonance physics, with those for vowels known in phonetics. The latter included, recapitulating, the perceived rough formant positions, the permissible bandwidth and the formants' optimized distribution. Adding to the latter the resonant spin ratio's of toroidal physics might accurately predict the formant positions for all distinct vowels. From the final result, the fairly equal distribution of the formant positions based on the proposed literary, physics and perceptive criteria, it appears that the approach is far from trivial. In fact, considering the available formant bandwidth, the positioning of the formants could hardly have been any different or any better and nature seems to have keen in utilising the given space to the maximum. Admittedly the personally perceived vowels locations are necessarily a bit fuzzy, however this was severely constrained by the permissible ratio's, while the resulting distribution appears to substantiate a fairly consistent choise. Especially favouring the toroidal spin resonance argument is the fact that the relatively widely spaced lower ratio's (1.41 to 2.45) are fully utilized, while those who would not likely contribute to a nice distribution (4, 4.47, 5) were anyway not allowed by the harmonic criteria. All by all it seems a unique and very consistent niche where nature has allocated our phonetic space. The map could be optimized a bit and especially the vowel "i" seems quite out of league, but it was left original to preserve the authenticity of the process. As a matter of fact, a more or less ideal position of the "i" formants (F1=280, F2=2200) was choosen by the makers of "Praat". Clearly there are interpersonal differences and simply taste. Finally, the (optimized) set as a whole could theoretically be fine-tuned along the ratio's. The presented evidence and proposed principle by itself clearly do not constitute solid physics proof. However, as discussed in the introduction, this new kind of physics includes "subjectivity" - not meaning personal interpretation, but as a universal, generic creational factor - verily the realm of pure idea. "Evidence based" thus gets a novel and more expanded meaning, beyond the traditional quest for objective proof. In this new line of thought, the principle of language can be understood as a universal means of expression, rather than a merely descriptive principle. Toroidal spin resonance, predicting the formants in a way consistent with our perception and other known criteria, while at the same time naturally consonant with the biological speech mechanism, appears to provide a realistic working model in the emerging field of causal phonetics. Practical applications of the proposed physics principle of vowel creation could lie in the field of phonetics itself, for example speech synthesis and developing a universal vowel standard. A much wider field of application could be in emerging intuitional sciences, especially creational physics which could generate an entirely new understanding of, and eventual control over physical effects which today are considered "anomalous". At the primary causal level, wave matrix physics or generally the Causal Matrix consitutes a full-fledged creational paradigm. However, as discussed before, without the individual mind there can not be any question of practical manifestation. The creational stages anticipating the biological mind, rather than saying those stages are merely theoretical, they are highly conceptual. Nevertheless, these initial, conceptual stages in cosmology include not only the subjective, but both the subjective and the objective portions of the material world, in seed form. In particular, and especially in the light of above discussion, the interaction between the Causal Matrix, in the form of the wave matrix, and toroidal spin physics should be studied. This is sure to provide a much needed link between contemporary physics (quantum / particle physics and general relativity) and the symmetry operations of the wave matrix. Moreover, it holds the promise to unify physics itself in the first place. This very specific stage could slightly philosophically be referred to as "Universal Mind", and constitutes the intermediate phase inbetween the biological mind and the earliest causal stages. As hinted before, the interaction between the wave matrix and toroidal spin physics is one of charge exchange, rather than one of wave discipline directly. The activating mechanism of the Causal Matrix is articulated in the form of coherence patterns among causal waves, serving as an engine or "pump" for scalar energy. The term "scalar" at this stage may equally be interpreted as the Maxwell potential of electro-magnetic waves, or in a more abstract style, as the qualitative aspects of EM- or causal waves. The term "scalar waves" is slighly misleading, i.e. all transversal waves have a scalar potential. is controlled by scalar energy released and resorbed by symmetry operations. This means that the torus, emerging as a stable oscillator in the universal medium is identical with, and physically constitutes the 3-D embodiment of the non-commutative circulation of scalar potential among the coherence poles of the causal wave matrix. The question arises then, whether this identifies the individual mind, or more accurately, the impact of individual mind on the universal medium? Indeed it does, noting that the existence of toroidal "inside-outness" in the purely universal phase is entirely theoretical. In a more general sense, in fact every stage in the cosmological paradigm can only be defined in terms of the consecutive order. The somehow limited scope of the individual mind results from it's starting point, which is the gradual, coherent assimilation of scalar potential, which takes the material form of the biological body with its evolving glandular, senso-motoric and central nervous faculties. The non-commutative flow maintained among the internal faculties of the wave matrix exists in two complementary forms. That is firstly, the potential emanating from infinite scalar synergy is "microvita" [P.R. Sarkar 1]. Secondly, the potential emanating from the infinite scalar connectedness is energy. Microvita + energy = life. Disambiguation: Golden Mean wave physics is properly associated with, and in a way facilitates scalar synergy, but is not identical to it. Golden Mean wave physics is textbook physics. 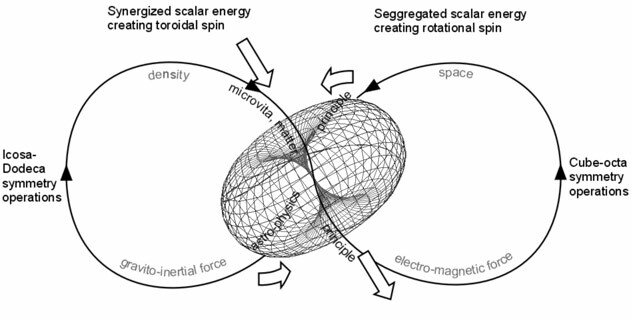 Scalar synergy should be described in its own physics and mathematical regime. See e.g. the work on potential vortices by prof. Konstantin Meyl 2 (http://www.meyl.eu). The wave matrix - torus interaction however shows a special and amazing feat, discovered before by the author, which in fact does imply some sort of geometric interdigitation. If a spin-ratio 2 torus topology is visualized through 7 distinct charge paths, those 7 paths are each exclusively and accurately indexed by one of the 7 spin angles (4 vertex, 3 side pairs) of the tetrahedron. The meaning of it, mathematically or in physics, is still barely understood. In ancient Vedic tradition, as well as in contemporary spiritual philosophy, the Universe is considered to be made of "sound and light". Especially in the case of sound in any classical sense, we cannot take that too literally. Rather, this deep intuitional statement should be understood in terms of the respective underlying principles, that is verily, the generic causal structure of sound and light, rather than its objective form. The causal structure of sound, insofar the vowels are concerned, is the subject of this article. Similarly, the causal structure of light was discovered earlier by the same author, demonstrating how wave matrix physics accurately predicts the wavelengths of the primary colours, as well as that of the retinal peak sensitivity. Special note: as the vowel formants found were all based on balanced dual spin configurations, this would imply there is no net perceptible creation yet. Adding consonants might add some juice to the genesis machine and actually get things started. This is exactly the traditional Vedic interpretation: most (not all) Sanskrit sounds of creation are combined consonants and vowels, e.g. : Ka, Kha, Ga, Gha, Una, Ca, Cha, Ja, Jha, Ina, Ta, Tha, etc..
Additional note #3: having fun with "Praat"
In the Vowel Editor, point at an F1-F2 combination or draw any line or curve through the F1-F2 space and it will synthesize and play the sound immediately. Below example shows how to draw "you"..! "Praat" can be downloaded from http://www.fon.hum.uva.nl/praat/. Biology's skill of attracting and organising scalar flux, and therefore its ability to be alife, can be measured at those places where the mind is most directly associated with the body. That is, the heart and brain. The highly conceptual, causal fluctuations of the wave matrix can obviously not be measured directly. The central nervous system (CNS) which practically evolves a microcosmic ("inside-out"..!) replica of the macrocosm, if for nothing else than for survival, obviously does that in the electromagnetic regime. In order to escape from endless cognitive regression, we should not forget that also the body and brain are but emerging mental constructs. That means, that the individual mind is rooted in universal principles, in the way described above, and not in the physical body. Thus it seems that the biological materials of heart and brain are the only places in the universe where the symmetry operations of the causal wave matrix can be measured directly. Practical application lies in the field of psycho-physiological diagnosis and training using the specially developed applications CardioGem and NeuroGem. Being a very early application of wave matrix physics, having hardly any classical context and reference, otherwise progressive therapists sometimes have a hard time fully embracing the principles. Unless they possess well developed intuitional skills and do not suffer too much academic- or peer-pressure, there is the risk of old, restrictive thinking patterns. With an openminded and somewhat playful approach, amazing experiences and results can easily be achieved. Wave matrix physics at work in psycho-physiology. Two geometric spectrograms from the NeuroGem, brain coherence diagnosis and training. Each track shows peaks indicating geometric recursiveness in the EEG spectrum. Typically these peaks are located around Golden Mean and Octave ratio's. The left recording (L + R hemisphere) shows little coherence, the right recording shows very high coherence as a result of biofeedback. Both recordings same person. During high coherence the test person reported a feeling of trancendence and strongly increased mental clarity, which lasted a few days. Two tacho (red) and ICC (Internal Cardiac Coherence, blue) history plots and ICC-histograms from the CardioGem, heartcoherence diagnosis and training. The first person is an adolescent with typically lower ICC. The second person, a mid-aged healthy subject shows good HRV (Heart Rate Variability) and ICC. 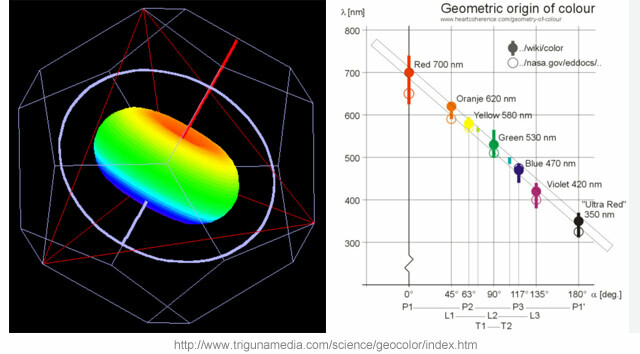 The CardioGem provides an final assessment of combined EGC and HRV coherence.